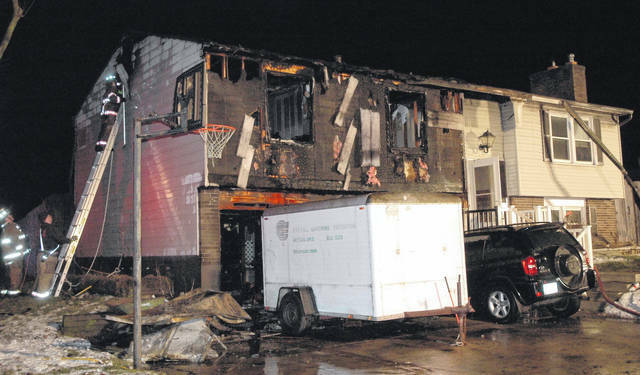 A home located at the southwest corner of Honeybrook Avenue and Afton Drive sustained extensive damage from a fire that broke out early Friday evening. CLAYTON — A home located in the 4000 block of Honeybrook Avenue at the southwest corner of the intersection with Afton Drive sustained heavy fire damage early Friday evening. Clayton was dispatched to the fire at 7:09 p.m. and upon arrival the garage of the home was fully engulfed in flames with the fire entering the second floor of the structure and eventually the attic, according to fire officials. Multiple local fire departments responded to the scene to assist including Englewood, Harrison Township, Union and Trotwood. The couple living at the house escaped but one of their two cats did not survive. The male resident said he smelled smoke but thought it was something his wife was cooking. He said he saw smoke and when he opened the exterior garage doors he discovered his entire two car garage was engulfed in flames, according to Clayton Fire Chief Brian Garver. An SUV and a trailer parked in the driveway sustained heat damage when the garage door was opened. The cause of the fire has yet to be determined. Not damage estimate has been set, but the fire caused extensive damage to the home.